SCI Recruitment 2018 2019 Application Form for 50 Trainee Electrical Officers Posts Download Application through Official website www.shipindia.com. SCI Trainee Electrical Officers Jobs Notification 2018 Released. 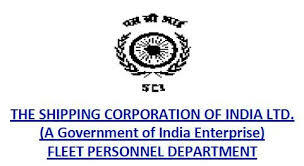 SCI invites Walk in Interview for appointment in following Trainee Electrical Officers post in Shipping Corporation of India. Candidates are requested to Download Application through Official website www.shipindia.com. Prospective candidates will have to before Walk in Interview carefully reading the advertisement regarding the process of examinations and interview, eligibility criteria, Offline registration processes, payment of prescribed application fee/intimation charges, SCI pattern of examination, SCI Syllabus, SCI Question Paper, SCI Walk in Date, SCI Result Date etc. A(i) Retired Indian Navy personnel with B.E. /Diploma awarded by the Indian Navy, and has sailed as chief artificer (power side only), and is in possession of DG approved ETO course and ETO COC. A(ii) Candidates with B.E/B.TECH/Diploma in Electrical or Electrical and Electronics, and in possession of DG approved ETO course certificate and ETO COC. Candidates to have 4 basic STCW courses and STSDSD/SSO certificate from DGS approved institutes. (i) Passed 10+2 with Physics, Chemistry, Mathematics and English with minimum 50% marks in final examination or must have obtained 50% marks in English subject either in 10th or 12th Standard exam, from recognized board. And (ii) Passed three years Diploma or Four years Degree with 60% marks in Electrical Engineering, Electronics Engineering, Electrical and Electronics Engineering, Electronics and Telecommunication/ Communication engineering or Electronics and Instrumentation. The diploma/ degree course must have been recognized by any State or Central Government or the AICTE. The age limit for the candidates for A (i) 45 yrs, and A (ii) 30 yrs. Age relaxation of 3 years for OBC and 5 years for SC/ST candidates. For, (B) Trainee Electrical Officers, 30 yrs. Age relaxation of 5 years applicable to SC/ST candidates as per existing Govt. Directives. Pay Scale: Selected candidates need to undergo 4 months residential ETO pre sea course and certificate of 4 basic STCW courses and STSDSD/SSO certificate at their own expense from Maritime Training Institute (MTI) Powai of SCI Course fee of MTI Powai is Rs.4,10,000/-. Candidate will pay fees to the Maritime Training Institute (MTI), Powai. Fees once paid are not refundable at any stage either in full or part.